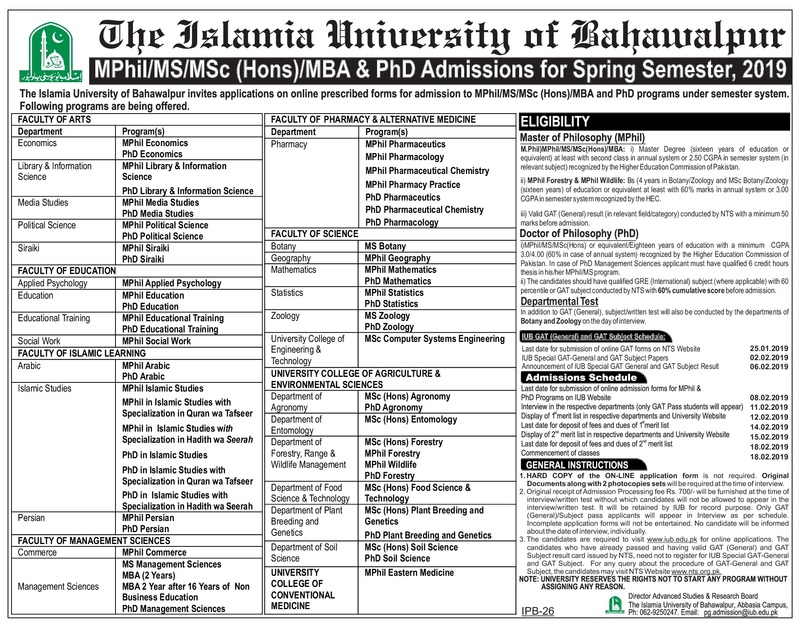 The Islamia University of Bahawalpur invites applications on online prescribed forms for admission to MPhil/MS/MSc (Hons) MBA and PhD programs under semester system 2019. The candidates they want to get admission in such programs they must apply for NTS GAT Subjective and GAT General Test before due date. For this NTS has announced the advertisement of Admission and also application form for admission. The candidates who are eligible to apply for NTS Gat General registration online is registered themselves before the 25th January 2019. The individuals can download application form and Deposit slip on this page. National Testing Service announced the roll number slips for all eligible candidates who are able to appear in the Islamia University of Bahawalpur MPhil/MS/MSc (Hons) MBA and PhD programs under semester system. Once you will apply through the National Testing Service than you must wait for the candidates list for the short listed candidates. In a few days NTS has declared the short listing candidates list who are eligible for written test of Islamia University for admission. In order to appear in any written test conducted by the National Testing Service (NTS), every candidate needs to have a roll no slip. To seek admission in Islamia University the most common hurdle in an individual’s way is to pass a written test conducted by the National Testing Service NTS. The testing organization has been working from so many years now and has the reputation of conducting quite tough exams. For preparation of NTS written tests most candidates often spend money on buying different books and sample paper. But now we have taken a step forward in order to facilitate our visitors in this case. For this we have compiled several online free testing service which can be used as guide for preparation of NTS GAT Test 2019.